At The Daily Blog on May 15, 2013, at 8:13 pm, while discussing The irrelevance of the rabid right, by Gareth Renowden, I asked a question. Accelerated warming of the ocean. The ocean soaking up about 93% of global warming. See Levitus (2012), Nuccitelli (2012) and Balmaseda (2013). Accelerated ice loss from Greenland and Antarctica. Shepherd (2012). Accelerated ice loss from mountain glaciers worldwide. See the World Glacier Monitoring Service (WGMS). Ongoing heat uptake by the land surface (up to 2004 at least). See Huang 2006. Ongoing sea level rise (it’s not currently accelerating due mainly to the deposition of heat into the deeper, colder ocean layers – thermal expansion reduces with lower temperature). See the AVISO website. The poleward migration of tens of thousands of animal and plant species, and up mountainsides too, to escape the warming. Continued intensification of the global water cycle. Westra (2013), Durack (2012). The increased blocking of longwave radiation by CO2 – as observed by satellites. Harries (2001), Philipona (2004). That’s an impressive list of evidence, so I want to thank Mr Painting for his trouble. I’m sure he would prefer to be rebutted if there are any faults in his evidence, rather than continue in his ignorance, so if you can contribute to an understanding of these pieces of evidence, I encourage you to comment below. Let’s put together a convincing critique. Bear in mind that even if we don’t like it it’s not necessarily wrong, so we need to provide solid evidence. After warming, we should examine attribution. Hmm, sounds as though I want my own AR5. Ok, why not? Doubtful, but I’m unfamiliar with the three papers. Magnitude? If it’s about 1.5 mm/yr then it has little anthro component. Magnitude, period? I doubt it was established that migration was motivated by excessive heat. How was “blocking” concluded rather than less energy being emitted? Why does he silently deprecate the use of the best temperature-sensing device we have, the thermometer, in favour of remote proxies? The question is, why do people like Richard Treadgold pretend as if this stuff has never been explained to them before? Anterograde amnesia perhaps? Nasty, but all he’s doing is trying to avoid a too-close examination of his excuses for confiscating my self-drive motor car and overseas air travel. There certainly is evidence of warming over the limited period 1976 to 1998. However, the point is what is the evidence for warming 1998 to 2013? There has been little warming, if any. 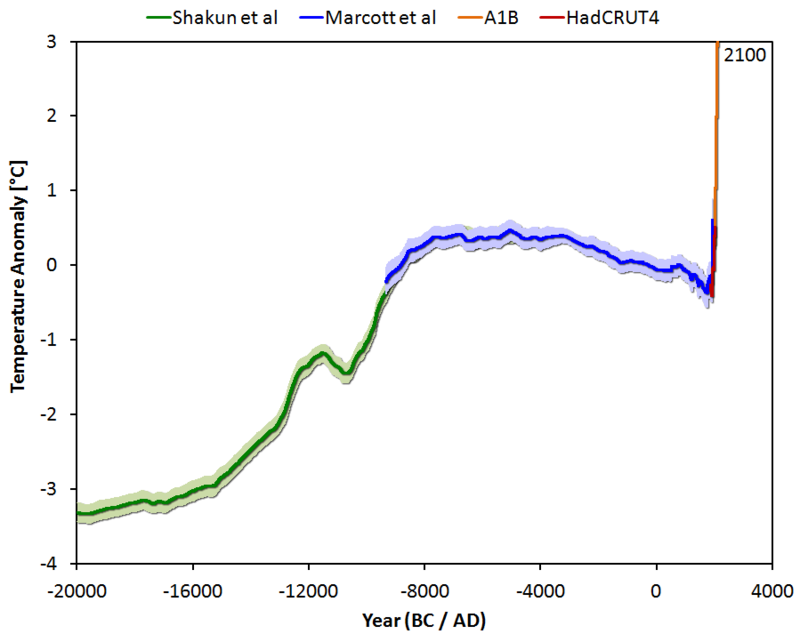 Yet the IPCC prediction was for warming of 0.21°C/decade, based on CO2 increases. This has not occurred. The obvious conclusion therefore is that the 1976-1998 warming was a simple natural variation, and the climate sensitivity is VERY much lower than the IPCC assumed. Then I suppose the attempt to rebut Painting’s response is spoiled by having omitted a time period from my question. What I find fascinating about those eight items is the glaring omission of the most obvious: Land/Sea and Satellite temperature records of the lower troposphere. Why is HadCRUT and UAH/RSS not mentioned? After all, AGW is an atmospheric effect. The heat is trapped in the atmosphere due to CO2 (direct forcing) and water vapour (feedback), which then causes the ocean to retain heat, since the warmer atmosphere is blocking the emission of the ocean heat energy to space. Simple. So the obvious place to look for AGW is in the atmosphere. So why did Rob not mention the atmosphere? Well, it’s because he can’t – the atmosphere is not playing ball. It hasn’t increased temperature in 17 years. Oops. So now we’re all supposed to look elsewhere, at proxies, like the deep ocean, or glaciers, etc. However, those are feeble thermometers, and have inherent problems, such as time lags. Once again, the climate sensitivity to CO2 forcing is way less than we’ve been told. I agree. You make the rebuttal look easy. But what about the assertion that heat energy is being stored in the ocean and will emerge to warm the atmosphere later — would that be of a magnitude likely to cause concern? >1. Accelerated warming of the ocean. The ocean soaking up about 93% of global warming. See Levitus (2012), Nuccitelli (2012) and Balmaseda (2013). Same for Nuccitelli et al using pentadal data and no basin-by-basin analysis. In short, OHC has peaked and in the process of de-accumulation (cooling). >5. Ongoing sea level rise (it’s not currently accelerating due mainly to the deposition of heat into the deeper, colder ocean layers – thermal expansion reduces with lower temperature). See the AVISO website. >8. The increased blocking of longwave radiation by CO2 – as observed by satellites. Harries (2001), Philipona (2004). Out of date. What is the latest data? First of all, they must come up with a plausible physical AGW-driven mechanism for heat energy to be stored in the deep ocean while the atmosphere doesn’t warm. This mechanism must also explain how this AGW-induced heat reached the deep ocean without warming the upper 700m. Remember, all the incoming solar energy is absorbed in the top 200m of the ocean. The sceptics’ position, on the other hand, is easy to explain: climate sensitivity is lower than the IPCC maintains. Therefore natural variation accounts for the 1976-1998 warming, and also the lack of warming since 1998, since the oceans are able to shed their excess heat easily via radiation, evaporation, convection, etc. CO2 is not a strong driver of atmospheric temperature, and so the atmosphere and upper ocean heating has dropped to zero, and over the past decade has decreased. The deep ocean warming we’re seeing is time lagged, and was driven from warming some time back. Exactly how long ago I’ll leave to the oceanographers, but it seems likely it’s in the 10-100 year range. No. As I explained to Thomas, the ocean is continually releasing heat anyway but up until the turn of the century gains were greater than losses due to high solar input last century. Now that solar input is reducing this century, losses will be greater than gains and the the accumulated heat will de-accumulate (cool). The accumulation will not be released in one dollop to warm the atmosphere to frying point but will be released progressively according to the lags of 6 – 100 years (Trenberth) i.e. the oceanic heat-sink is a climate modulator, storing heat when input is high, releasing it when input is low. If not for the ocean, atmospheric temperature swings would be radical as evidenced by the diurnal range over land in NZ (maybe 10 C) compared to the diurnal range of tropical air over ocean (maybe 1 – 2 C). Absolutely, Richard C, with the small proviso that solar input may not just be TSI – it may be that other mechanisms are at play (Svensmark for example). Yes. Abdussamatov (2012) posits other TSI feedback mechanisms, one being CO2 outgassing from a warmer ocean. Without making an issue of it, I’m more inclined to think Svensmark effects are oscillatory on a shorter time scale (even decadal) than the Grand Max – Min — Max TSI period of quasi-1000 yrs. There was an article in the news a day or so ago that GCR intensity has increased lately but I don’t know that GCR is inverse to TSI over 1000 yrs (can’t recall the graphs off-hand). However, the spatial pattern of ocean warming with depth is very consistent with heating of the ocean resulting from net positive radiative forcing, since the warming proceeds downwards from the upper layers of the ocean and there is deeper penetration of heat at middle to high latitudes and shallower penetration at low latitudes (Barnett et al., 2005; Hansen et al., 2005). In other words, the surface heats first, and gradually the heat moves downwards as each layer “sees” warmer layers above it. I would love to hear Painting explain how AGW increases the deep ocean temperatures without either increasing the atmospheric or upper ocean temperatures. I bet there’d be a lot of arm-waving and general discussions of “circulation patterns”. That is, solar input TO the ocean LEADS natural carbon dioxide output FROM the ocean (natural CO2 being by the greatest atmospheric contributor) by about 50 years. To say CO2 drives SLR when it is obviously driven by solar input is tail-wagging-dog, cart-before-horse stuff. Having engaged in that discussion already with Rob P (at SkS or JN I think), the explanation is vortexes/gyhres (I forget the actual term applicable). Such phenomena do exist and have been investigated in the literature (referenced in comments here at CCG somewhere not so long ago) but they (the ones in the literature) are relatively small, seasonal, sparse, and localized i.e. nothing anthropogenic. OK Bob (seeing as you’re the AGW proxy/stand-in proponent for the moment), atmospheric heat actually enhances ocean heat loss by evaporation (Hl) – that’s a key plank of AGW conveniently overlooked by you in this case – and radiation (Rnet) is still positive so energy egress continues by those two major means uninhibited (maybe a negligible change to Rnet over time but where’s the evidence of that Bob?). So how is the warmer atmosphere “…blocking the emission of the ocean heat energy to space. Simple.” ? Sensible heat (Hs) requires a sea => air thermal gradient for egress and the global average difference is sea about 3 C warmer than air – no problem for egress then. Where is the evidence that there is an air => sea gradient (does exist in the tropics) of enough difference for heat transfer (J/s, Watts) from the air (low spec heat capacity) to heat water (high spec heat capacity) in quantities (Q) such that the IPCC’s “expected” “air-sea fluxes” are enough to explain OHC rise given the entire quantity of heat in the total atmospheric column can be accommodated in the top couple of metres of ocean and given the convention of convection? To get sufficient heat moving DOWN from air => sea, the heat must move from high up in the atmosphere. This is in direct contravention of convection laws. The TSI reconstruction above is Lean 1610 – 2000, PMOD 2001 – 2012 and the TSI uptick begins 1900. 1930 and thereabouts was a cool sun followed after by a hot sun. This coincides closely with the SLR inflexion at 1930 so the effective TSI/SSN – SLR lead is somewhere between 1900 and 1930 as I see it. I haven’t yet seen any literature that addresses this to corroborate my interpretation so I guess I’ll have to wait or wing it on my own. In any event, solar and SLR are in sync thermodynamically but CO2 is the laggard. Bob, lets start with data, observations, facts. Have a look. It looks to me as if the ocean heat content is rising and has been rising pretty steadily through especially also the last 20 years. Before you get lost in the mechanics of how the heat gets there or the intricacies of the ocean/atmosphere interface, let the temp data speak for themselves. Unless you have other data that contradict these we should I believe be able to agree that ocean heat content has been rising and that there is no hiatus whatsoever in the global ocean heat content graph. You can navigate in time or in depth or go to the menu and select what you are after. Take the thermometer gun and point it to the sky (not the sun obviously). It will indicate a temperature, the temperature of the dominant layer it ‘sees’. If you point it to a cloud you will read the temperature of the bottom of the cloud. If you point it to blue sky (or clear nigh sky) you will read about -50 degrees perhaps or sometimes warmer, depending on moisture content. The point of all this is this: the dominant visual (IR spectrum) atmospheric layer that the surface is exchanging IR radiation with has a temperature, and you can measure that. Sigma = 5.67x10E-8 W m-2 k-4 = Boltzmann constant. If you put say 15 Deg C = 288K into the equation you will see that a m2 radiates with 390W. If you put sat -50 Deg C = 223K into the equation you will see that a m2 radiates with 140W. It may surprise you that a m2 that is at -50 Deg C still emits 140W/m2 of thermal radiation! Now in this example the 15 Deg C surface, say the ocean, looses heat via radiation to the colder layer at a rate of: 390-140=250W/m2. Now if the colder layer was say 5 Deg warmer at -45 Deg C then it radiates at: 153W. Now the net balance is: 390-153=237 Watt or 13W less heat loss than before! The point of all this is: a) You do not need to have an atmosphere that is warmer than the surface to cause the surface to lose less heat through cooling and therefore retain more heat from the day and consequently warm. b) The IR heat exchange is not between the surface and the surface air layer, but, depending on cloud cover and atmospheric conditions, it happens with layer that are quite high. c) When you play with the Boltzmann equation, I recommend you make a simple spreadsheet and play with some data, you can see how little temperature change in the atmosphere is required, at a temperature very much below the surface temp, to vary the Net radiative heat flow from the surface by a large number. A change of 10W/m2 is very significant as you will know that the AGW climate forcing itself is presently only around 1.5 W/m2 or so. Therefore the assertion: We have had a relatively slow rise in air surface temperatures => the oceans can not have retained more heat, is entirely invalid as in most cases air surface temperatures have actually little to do with the IR heat exchange of the land or ocean surface and the atmosphere. Another example that is readily handy in winter is a car parked outside at night. After dark and with clear skies, the car roof will quite quickly cool down well below the ambient air temperature and condensation forms. Why? Because the IR heat exchange, which is the dominant heat exchange between the car and the atmosphere, happens not with the air surface layers (then the car roof would remain at the surface air temp) but predominantly with much higher layers in the atmosphere. I’m sure none of this was news to Bob, but it was to me, and interesting, so thanks, Thomas. Heat transfer between the atmosphere and water or land isn’t only by radiation. How does convection compare with radiation in moving heat to the atmosphere? 5-year averages of mixed data doesn’t do it for me. Look at the ARGO data. It’s all you need. The lack of warming in the oceans is a given, acknowledged by all. If you wish to deny that, then go to it, but really, you shouldn’t try to convince me, it won’t work. I have the ARGO data on my computer, you can go and get it too, it’s free. The point of all this is: a) You do not need to have an atmosphere that is warmer than the surface to cause the surface to lose less heat through cooling and therefore retain more heat from the day and consequently warm. Strawman argument. I never said the atmosphere had to be warmer than the surface, did I? b) The IR heat exchange is not between the surface and the surface air layer, but, depending on cloud cover and atmospheric conditions, it happens with layer that are quite high. Another strawman. Why would IR heat exchange be only between the surface and the surface air layer?! c) When you play with the Boltzmann equation, I recommend you make a simple spreadsheet and play with some data, you can see how little temperature change in the atmosphere is required, at a temperature very much below the surface temp, to vary the Net radiative heat flow from the surface by a large number. A change of 10W/m2 is very significant as you will know that the AGW climate forcing itself is presently only around 1.5 W/m2 or so. Once again, strawman argument. I never mentioned any of that, and it’s irrelevant to my question. You are attempting to divert the discussion from what I said to some other that suits you. I don’t need a lecture in radiative physics, I understand it well enough, thank you. What I asked of Rob Painting was a clear physical AGW mechanism that will heat the deep ocean without heating the atmosphere or the upper ocean. Let me help you: you have to start with a delta global increase in CO2. Take it from there, if you wish to convince me you must be logical and exact. This is your chance. We do – basin-by-basin analysis vs aggregate. Err no. See above and below. As we would expect, but it’s not anthropogenic and the “surface layers” are only the skew of the Indian Ocean data. It’s basin-by-basin that matters. If the upper Pacific and Atlantic have been cooling since at least 2003 (as the data speaks it has), and the upper Indian is at stasis, and the 0 – 2000m aggregate is at stasis, there is obviously reduced energy input to all global oceans and OHC warming has ceased. Any warming below 700m is lagged by many years (up to a 100 or more – Trenberth and others) so the heat there is certainly not of recent origin. This is totally consistent with solar energy input and circulation but not CO2 and circulation. There’s empirical observations of actual readings (SW/LW Rdown, LW Rup, Rnet, HL and Hs) at the surface e.g. Fairall (1996) – see Table 5. Why not defer to the data from those papers and the conventional heat loss equation instead of making stuff up? The difference is only 63 according to Trenberth et al but empirical observations (e.g. Table 5 above) vary depending on latitude, season, etc so why not use one of the real-world case study examples? I found some diurnal studies recently in a ding-dong argument with RT (yes sceptics disagree and sometimes vehemently), they’re referenced a few posts ago. I not sure that was anyone’s argument here in the first place and we’ve already seen Rnet calculated from the observations anyway in observational studies so no surprise i.e. strawman. The IPCC “expect” “air-sea fluxes” as an anthro mechanism to warm the ocean on the other hand which is somewhat problematic as I go into in ‘The Improbable IPCC Mechanism’ linked elsewhere in these threads. THAT’s the issue. It happens between any layer that emits and the emitted ray is not intercepted but again I think you are creating a strawman because that’s not an issue to anyone else I don’t think. Whose “playing”? What is required in that exercise is observational evidence of DLR change over time (say 10, 20, 30 years). The IPCC do not have that for the ocean and observational studies (rough cites: Gero and Turner, Francis and Hunter, Wild et al, and some Chinese names I can’t recall) over land find no such CO2-consistent increase. Regionally, the sign can be negative or positive and magnitude varies wildly over different timeframes. And you have to separate out a CO2 component from DLR that includes emission from WV and clouds i.e. by far the greater than CO2. Then you have to separate out the anthro component (aCO2) from natural+anthro CO2. In fact, aCO2 forcing as compared to DLR is miniscule and the signs incompatible so your reasoning is daft. We’ve been over this several times here at CCG by quantifying the respective CO2 forcing (a tiny fraction of 1.5 W/m2 over a decade say) using F = 5.35 ln(C/Co), reducing for aCO2, and comparing it to observed DLR over the timeframe of a specific study. Anthro forcing is always trounced into insignificance. You’re making the assertion Thomas,not us – strawman. The exchanges are Rnl, HL and Hs. Rnl also considers SW Rdown/up i.e. the initial energy input is SW Rdown. The contentious issue is how much that has changed in the last 400 years or so (range of contention 6 W.m2) because OHC accumulation is more about the initial energy input than an inconsistent change (as per short-term observations) in DLR/OLR over that time. Air surface temperatures have something to do with OLR because the energy (Q) lost from the ocean is a sum of Rnl + Hl + Hs. The respective quantities have been in observed at in-situ studies. OLR (after netting) that doesn’t go direct to space goes to the atmosphere. I believe I made the point that you do not need to have a rise in air surface temperatures to cause a drop in cooling and thereby warming of the oceans. See above. That is all my little radiation lecture was going to achieve. 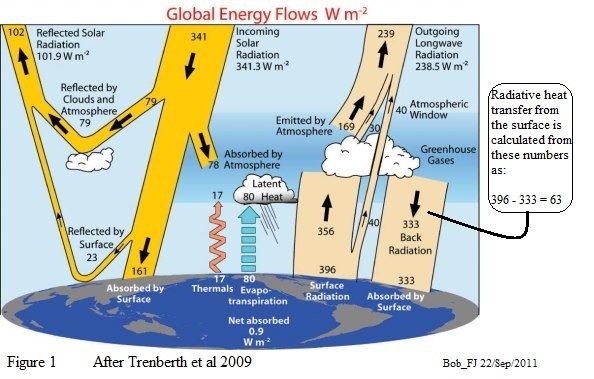 I have many times witnessed people who deny AGW also deny (or have demonstrably no clue about) radiation physics yet claim that ‘back radiation’ does not exist or that a colder surface (air say) can not affect the heat flux and heat content of a warmer (Earth surface). I hope showed that indeed even small changes in a rather cold layer (high atmosphere say) can significantly effect the cooling rate of the surface. Of cause in the real world, ocean heat loss has several pathways, from evaporation to air convection etc. with evaporation being a very significant mechanism for heat transport. But the radiative heat loss is a large component. Air has a low heat capacity and low conductivity. Thats why radiation heat loss dominates in many cases such as the cooling of your car roof well below ambient air temperatures. And all I needed to prove to you to answer you question really is, how little change of atmospheric conditions you need to affect the cooling rate of the surface and that the surface air temp is not really that important. First of all as you pointed out yourself, the ocean is not uniform in its temperature at all. We have areas of very cold deep water welling up, down welling of water elsewhere and significant ocean currents transporting with the water huge amounts of heat around the globe. Heat gets transported into the bottom layers due to these currents and down welling. In fact, if you observe a rise in deep ocean temperatures you will expect to see cold deep water elsewhere welling up. You may see even a temporary drop in surface temps someplace else as the exchange of deep and top later water happens. As an example, the down welling of water in the Arctics is major driver of the Atlantic ocean currents. Now in the summers over the last decade we have seen a very significant decrease of ocean summer ice in the Arctic, which causes the waters there to be much warmer due to the change in albedo. What happens with the heat? Will some of that change the temp of downwelling water? You bet. Do you need higher top layer temps in the Indian Ocean or other basins to affect that? No. In another way: If you let a swimming pool stand still with sunshine hitting the top, waters will stratify in warm top layers with cold water at the bottom. If you stir, the temperature in the bottom will warm and you may see a temporary cooling of the top as the bottom colder layers are brought up. All the time though the heat content of the pool rises. I hope this analogy makes it more plausible to you understand that it is not a contradiction to have a greater arrival of new heat at the bottom layers than the top for some time. Now you can cite to your hearts content that some ocean basin here or there has not warmed in the last year or two or whatever. 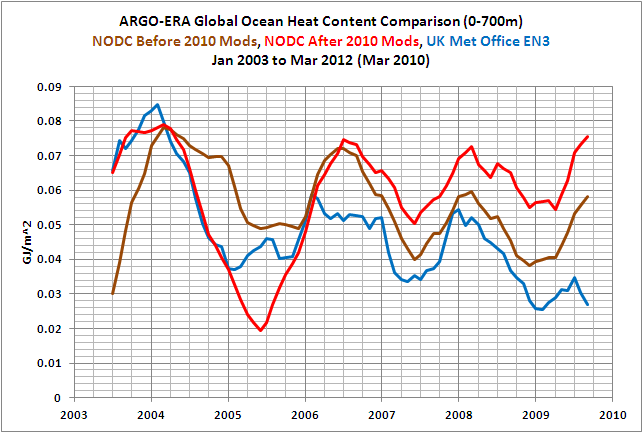 The graph above is the total ocean heat content, counting all layers to 2000m, globally. When I look at that graph I do not perceive a hiatus. Do you? Pointing at select ocean basins is like pointing at cold temps in winter and claiming AGW is over. And Bob, you say that pentadal averaging is not doing it for you? I suppose it averages out short term fluctuations in the data to show trends more clearly. But I guess that is indeed not helpful to your argument. But I think that pendadal or decadal averaging is the best way to see trends in noisy data. Don’t you agree? Of cause if you want to hide the trend at a time when the noise in the data points your way, you will focus on – well – the noise to deny the trend. I have little problem with most of what you write, excpet that it’s kinda 101-level stuff. Also, nobody disputes that ocean currents occur, but the fly in your ointment is that the process takes hundreds of years. It can take over a thousand years for the waters to re-appear at the surface again, on the other side of the world almost. I doubt you’ll get many takers on your idea that “warm” water from the Arctic is going to suddenly spread itself all over the deep oceans within a matter of decades. But in order for AGW to drive any ocean process, you have to explain how the ocean will warm up (surface or deep) as a result of higher CO2 concentration in the atmosphere, while the atmosphere doesn’t itself warm. Arm-waving about circulation patterns isn’t going to do it, as I mentioned above. By the way, I’m really quite interested to hear the explanation, as I’ve thought about it a great deal, and I honestly cannot think of a mechanism. I’m quite happy for someone to explain the standard AGW position on this, because I’ve yet to find a decent description of even what it is. Beyond general ad-homs and mutterings about “circulation patterns”, that is. It’s difficult to argue against a position when people refuse to describe what that position even is. Of course, one doesn’t then even have to argue against them, they have conceded the debate right there. What I’m getting at here Thomas is that DLR power is illusory (even Trenberth et al’s 333 W.m2), like the electrical “apparent power” equivalent i.e. solar SW IR-A/B has real (electrical “real power” equivalent) penetrative power at higher energy-per-photon than LW IR-C and is therefore an effective ocean heating agent at depth. 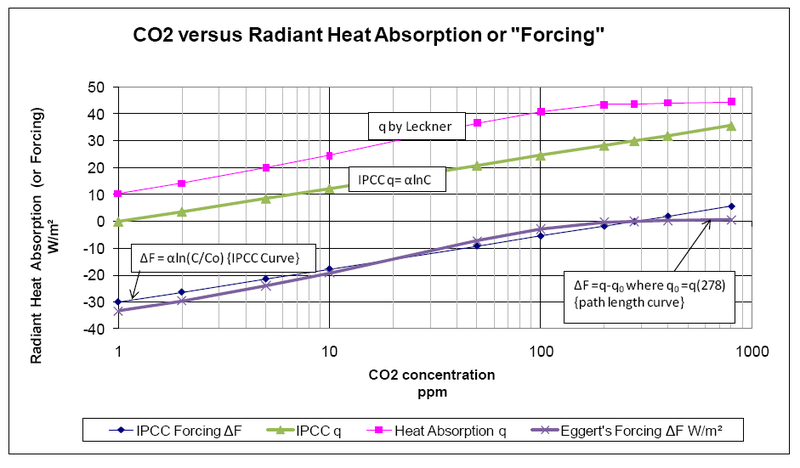 DLR (IR-C) does not have effective penetrative power beyond about 10 microns so is not on the same power/heating-agent basis as IR-A/B (remember the EM table of frequency/energy levels shown previously) and is not the bulk ocean heating agent that solar SW is (not all UV is blocked in the atmosphere either so there is heating effect from that too – think UV-A/B sunburn but skin is a different material to water, but not that much, so penetration differs i.e. radiation/material “tuning” at the range of EM frequency is very important). Also, the observed levels of solar SW IR-A/B at the surface are at much higher intensity than LW IR-C in day-time and If IR-C had effective heating power, horizontal solar collectors would be very effective at night. Deeper penetration occurs obviously but not as effective as say 1m deep at 1 micron frequency. Also how radiation frost occurs but how is this relevant to ocean heat accumulation/de-accumulation when it is not a prevailing condition? Heat gets transported into the bottom layers due to these currents and down welling. Not really. Temperature is the main driver of water density. Downwelling on a large scale only happens in the polar regions, where the surface waters are able to cool significantly by radiation relative to the underlying layers. Typically, the temperatures reach about -1.9°C, and the water doesn’t freeze because of the salinity. When the surface temperature falls below that of the lower waters, the lower waters rise up and the cold surface water sinks. By definition, the surface waters must be colder and denser than the deeper waters for this to happen, and so in fact most of the heat transport is upwards, not downwards. Warmer water will not sink below colder water in general. The significance of the effect is of course the creation of great ocean currents, but as a heat transport mechanism it doesn’t heat the deep ocean. You’ll have to go up-thread from there to get the links but you find a no-holds-barred exchange between myself and Richard Treadgold that might surprise you. In other words, we are not new to this topic and the point is that I countered RT’s intuitive argument (similar to yours Thomas) with the scientic observational literature. The issue is forcing over the long-term and the mysterious anthro ocean heating mechanism but you have not presented any science (no citations) on either. We knew that already and can cite papers (where’s yours?) of the observed effects at the surface to short-term changes above but it’s not the issue. Exactly, see the conventional ocean heat loss equation and observed values for Rnl, Hl, and Hs in papers like Fairall et al and those cited above. Glad you’re back in the real world. Thomas, quit the irrelevant anecdotes. They may be relevant to another discussion of say radiation frosts but not here, Go to the ocean-air specific observational literature as we have and get “real world” values of the respective components of Q, Rnl (and its components), Hl and Hs in the ocean heat loss equation. Then we have substance to address instead of your hand waving. You can apply the relevant processes afterward – no problem. Rubbish, you haven’t even STARTED to grasp the issues that we are dealing with. The deep oceans are completely irrelevant to a forcing from above the surface except for say wind to drive overturning and deep energy is lagged energy (we’re talking 100 years, even a 1000). If any anthro effect is to be seen it will be in the upper ocean but the upper Pacific and Atlantic have been cooling for at least the ARGO era (as I keep saying – it’s getting tiresome) and the upper Indian stopped warming 4Q2010 so where’s the anthro effect? An aggregate of 3 major bur separate basins. An aggregate of several layers with different thermal characteristics and heat quantities. Not much can be learned from it and it has peaked anyway (see data posted elsewhere). “Some basin”? “Year or two”? There are only 3 major basins and 2 of them have been cooling since at least 2003 – that’s a decade Thomas. Of course you don’t, the graph you are looking at is meaningless unless the constituent parts are analyzed which you steadfastly refuse to do. Yes, because I (and Bob D and others esp Bob Tisdale) have the knowledge of its constituent parts both regionally and vertically i.e. we break it down basin-by-basin and depth-by-depth. What, in effect, you are looking at is the Indian Ocean skew to the global aggregate. Utter tosh and a specious comparison. 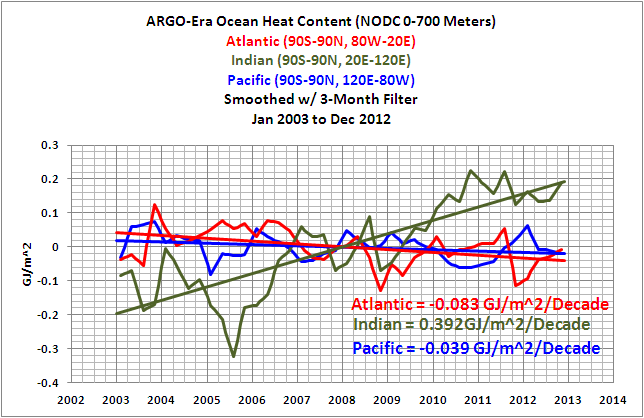 There is no need to truncate ocean heat by centred smoothing that loses 5 years. Ocean data is already smooth enough, the NODC smoothing is 3 months but why not use a SMA if more smoothing is reqd so that the current up-to-date data is not truncated i.e. the data is only lost at the beginning not at both ends? Ocean heat is hardly noisy, it is inherently damped. But if you want smoothing, have the smoothing run up to the last datapoint as in a simple moving average (SMA). It is the trend at 2013 that sceptics are vitally interested in. Warmists on the other hand have a predilection for truncated data series e.g. Balmaseda et al ended their OHC analysis at 2009. As above, no-one is hiding or denying the trend and what “noise” in OHC? The latest trend is stasis or cooling and the uncertainty in the data is far greater than the (minimal in OHC) noise. I know I posted that graph several times before, but somehow you see stasis or cooling in the last decade, where I would eyeball a rise of about 4×10^22 joules of ocean heat content over the last decade by looking at the graph. You correctly described the drivers for the ocean conveyor belt. Nevertheless, ocean surface water temps in the Arctic have been rising. In fact the ocean surface heat anomaly has been especially significant in the Arctic. You can go back in time or select whatever averaging you like. Now for as long as the ocean down welling in the Arctic is still working (and on another matter entirely, some folks point out as you did yourself, that warming top levels in the Arctic may dampen or even shut down the convection with disastrous consequences to the oceans ecosystems) these now warmer waters are still currently going down taking their energy with them. As far as the speed of these currents go, well, the surface currents run at speeds of a couple of knots easily, covering oceans in months. The deep thermohaline circulation is more at the order of 1cm/second or about 300Km per year. So in a decade you still cover ocean size distances. And true, some waters have been tested that spend on the order of 1000 years or more in the ocean conveyor systems before emerging at the surface. But we are not talking here about the need to go full circle, all you need to realize is that on a scale of years, the energy transport into the deep layers of the oceans by the means of the thermohaline circulation transports a very significant amount of energy to the deep oceans. The 4×10^22 joules added to the oceans total over the last decade are a massive amount of energy indeed. Just to make that large number more palatable: Its the equivalent of 12,700 GW (giga watt) constantly heating the oceans. That’s 12,700 Nuclear Reactors @ 1GW each running 24×7. That is not trivial or inconsequential. Bob, you complain that my radiation physics examples are 101 stuff. Yes they are. But rating from the confusion level that is persistently evident in statements made by people at many AGW denial blogs, that is what I think is required to go back to. If you spend a bit of time reading stuff say at Talblokes corner (and he was cited here by somebody as a source…) then you will understand what I mean. There are many people who will tell you outright, that a colder surface against which a warmer surface stands in a radiation exchange, can not affect the temperature of the warmer surface for example. Some go to write down gibbrish equations and mad theories to ‘prove’ that…. I have heard that too many times and there seems to be deeply rooted misunderstanding about basic radiation physics at the bottom of many people’s gut reactions to and rejection of climate science and the GHG forcing and warming concepts. You asked the questions to which I responded. And the way you asked them demonstrated that pointing out 101 physics to you might be helpful. If it was not helpful to you, then perhaps to those reading the posts. BTW, Richard, C and T and others, I don’t have the time to respond to all your posts. My apologies, the coffee brake is only so long. I will keep my dialog with Bob as a proxy. I scan what you say if I have the time to do so. Although Argo data is also sparse: On average there is one Argo buoy per 320km x 320km, or 102,400 square kilometres. Average depth of oceans is 3.6km, therefore on average each Argo buoy is sitting somewhere in 368,640 cubic kilometres of water. And although there are questions about Argo buoys’ reliability at depth, it is the best data we have to date. Therefore, we have sparse data since 2003, but it is so much better that taking buckets of water on board a ship (once in a blue moon) and taking its temperature. In case anyone thinks I’m trying to create the impression that I “won” the argument, that is definitely NOT the case. RT was certainly not all wrong. It was really about the word “most” and RT’s intuitively-based argument. My counter was to present real-world observational studies to provide an indication of values/quantities/flows etc that were lacking. I suggest Thomas, that you do have a look at that thread and the quotes from the papers and to read the papers directly also. You cannot base your argument on hand-waving and made up figures. It is not until you look at case studies that the complexity of the AO interface and subsurface interactions becomes apparent and an indication of the magnitudes of each component are gained. That includes sub-surface horizontal and below layer fluxes, and unit mass storage BTW. And starting from diurnal studies is the best way to progress to the solar-ocean-atmosphere lags Trenberth identifies (6, and 10 – 100 years). Thanks Mike, Willis is pretty good at putting these figures into context. Surely they must be well below the resolution of the instrumentation? Increased levels of anthropogenic CO2 in the atmosphere have caused an increase in atmospheric temperatures by increasing SSTs and slowing the rate of cooling of the oceans via radiation. This increase has been greatest at the poles because there is lower water vapour there and so the effect of CO2 is much greater. The increased surface temperatures have been drawn down into the depths as before due to the thermohaline circulation, and have spread throughout the deep ocean in a matter of years, causing the increase in OHC below 700m. This has had the effect of “hiding” the heat that would otherwise have remained on the surface and caused an increase in 0-700m OHC. Can you confirm that this is your position? If not, please modify to suit. That’s a blatant lie Thomas and you should know it you had been paying attention. 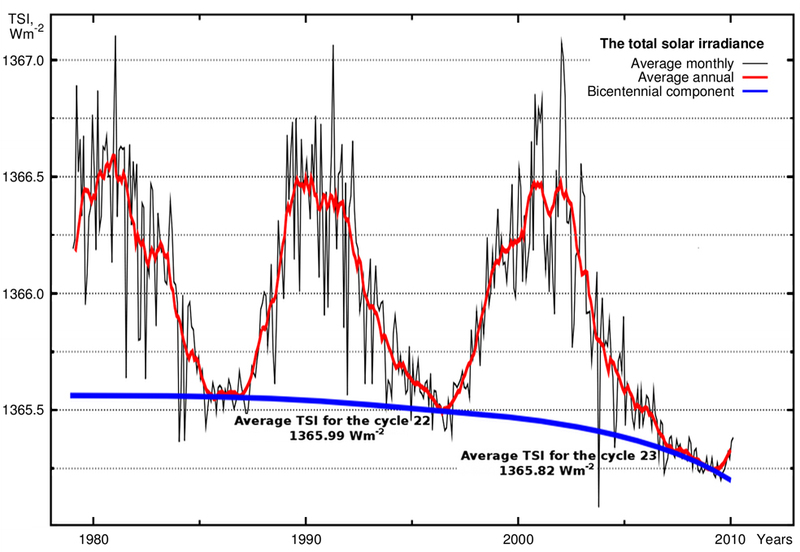 The graph is NOT by Tallbloke, it was by Prof John Eggert (“eggert-co2.png”). Roger Weatherall simply hosted the graph at his ‘Tallblokes Talkshop’ website/blog (“tallbloke.files.wordpress.com”) from where I accessed it using the URL above. WHERE was (not “is currently” note) that rise occurring Thomas, and WHEN? NOT in the upper Pacific – that’s cooling. NOT in the upper Atlantic – that’s cooling. NOT in the upper Indian since 3Q2010 – that’s at stasis (or even cooling now too). WAS in the upper Indian – that WAS warming spectacularly up to 3Q2010 but no longer so. Below 700m (a substantial depth note) there are considerable lags. The energy there originated in the top few metres maybe 6, 10, 100, or 1000 yrs ago. Keep in mind though, Ganachaud & Wunsch is a 2000 paper even though it up-dates an earlier paper i.e. the heat budget now is not necessarily the heat budget then. But I suggest you put your statement “The 4×10^22 joules added to the oceans total over the last decade are a massive amount of energy indeed” into the context of the regional energy uptake, transfer, and release budget calculated in PW and also where the major uptake WAS occurring at time of budget 2000 (Equatorial Pacific) and where the major releases WERE occurring at time of budget 2000 (Nth Pacific, Nth Atlantic,Sth Indian, Mid-Sth Atlantic). Can you identify your anthropogenic contribution there anywhere specifically Thomas? I missed that update at JN Mike, good of you to point out your elevated status. Jo keeps a close eye on OHC so I’m not surprised she highlighted your exceptionally well presented and concise (as usual) comment. The Equatorial Pacific uptake alone around 2000 according to Ganachaud & Wunsch was in the order of 1.3×10^15 Joules PER SECOND (PW). Much more during the day-time solar peak, not so much at night. The researchers say the difference between the lower short-term estimate and the more consistent long-term picture can be explained by the fact that the heat from the last decade has been absorbed into and is being stored by the world’s oceans. Not everyone agrees with this perspective. Prof Steven Sherwood, from the University of New South Wales, says the conclusion about the oceans needs to be taken with a grain of salt for now. “There is other research out there pointing out that this storage may be part of a natural cycle that will eventually reverse, either due to El Nino or the so-called Atlantic Multidecadal Oscillation, and therefore may not imply what the authors are suggesting,” he said. This is an article about the Otto et al paper that has been widely written about in the last few days. It seems remarkable that the paper’s main conclusion seems to be that ECS and TCS are lower than IPCC estimates, yet they still claim there is no change. This looks like a pretty unreasonable attempt to spin the result as nothing new for sensitivity, when it is clearly something very new indeed from these authors, and implies a marked lowering of the IPCC “likely” range. So although the analysis does depend on a few approximations and simplifications, it’s hard to see how they could continue to defend the 2-4.5C range. I get a 0-2000m accumulation per second of 1.3×10^14 Joules for the entire ocean @ 4.0×10^22 Joules per decade. An order of magnitude less than just the Equatorial Pacific uptake unless I’m mistaken. I’m just astounded that a) Steven Sherwood was the one to point that out, and b) the MSM (Brisbane Herald and BBC) are reporting it Mike. Finding it hard because of that to shift my mind to the stubborn IPCC resistance to budge from 2-4.5C that Andy is pointing out. These are three developments of differing import that indicate where things are heading perhaps – for Sherwood (maybe others will follow now rather than fawn), the IPCC (the pressure is on them now), and ECS/TCS (that’s gotta change now surely). First there was Global Warming. Then, because it wasn’t warming, Climate Change. Then, Climate Disruption, because we could be sure that somewhere in the world every year there would be a storm, flood, wildfire, drought for which to blame Disruption. Now we have Ocean Heating. Because it’s a travesty if we can’t find that missing heat. And when all else fails, we have Delayed Warming. Whereby we lower our projections of warming, increase our uncertainty bands and say something like, “This temporary slowdown in accelerated warming is something we can’t explain, but is in line with our original projections and it may take a little longer for the world to fry, but it will happen!” Have we now entered the chapter “Revised Global Warming”? Wherein it will be in a state of continual revision and always in line with projections, and always seeking more grants for more research. Oh, wait…. nothing’s changed. It doesn’t matter that these findings are complete BS, but that is the reality. No, everything’s in order, Andy. “Want” means “to lack”, which I mean to remedy. I’m just not sure what connection the list of evidence of warming he gave me has to the survey. No, there’s no connection; never mind, I’ll rebut his list anyway. My point is, for what it is worth, is that this has never been about science. It does get me down though. Richard C: Ganachaud & Wunsch talk about the heat transport between various regions, and yes there a fluxes in the order of 10^15 watt involved (PW) obviously. But transport from A to B is not equal stored, as a large part of the transported heat is ending up eventually being lost again from the ocean in the colder areas to which it is transported. In the end, the added cumulative energy to the entire ocean system over the last decade is around 4^22 Joules. If you don’t agree with the data that NOAA publishes I suggest to write to them and explain what the data should be according to your own methodology and calculations. By the way, feeling down helps when you have someone as articulate to express yourself though as Danny Weston who recounts his experience questioning the faithful at a James Hansen gathering. Where do YOU suggest that all this extra energy came from? Do you have alternative explanations? Lets look at the balance: Input versus Output. Input: The Sun – no, that has not been increasing its input into Earth and if anything we have a slight decline of solar input into Earth to witness. Output: So it must have to do with a decline in Earth’s heat loss capability. If the energy input has declined a bit but the energy balance is going up, you will need to look at the energy outflow. So it happens that humanity has raised CO2 from 280ppm to 400ppm over the last 100+ years due to fossil fuel burning and, so it also happens that CO2 is a very efficient absorber of IR and enhances the heat trapping in the atmosphere and the resulting increase in back-radiation and lowering of the Earth’s cooling capacity. Hence scientists around the world have set to calculate and model what that added CO2 ( and methane etc. ) caused and have found that it explains the rising heat content rather well. If there was yet another source of heat (or outflow dampening) elsewhere, we would see that in our data but we don’t. So unless you can come up with a theory that: a) explains what happens with the trapped heat due to CO2 that we know must exist and why we should NOT see that in our data (even though we do), and also b) explains where else the heat is coming from if not from the CO2 forcing, you must accept that its the CO2 forcing that we see in the energy budget response of the planet. My comment @ 12:38 today, #200693, used to be a bit longer as it looks now. Lets put it down as a WP glitch. happens. I think I added a couple of paragraphs in the comment editor and perhaps ran into the timeout. No problem. So, you need to show the rest of the world why we need to believe your version of the science. Andy, you can turn on the ‘error bars’ in the NOAA data if you like. It would seem that the rise in ocean heat content of the global heat content of 4×10^22 j in the last 10 years is significantly larger than the error bars, let alone the rise over the observational period of the graph. The reason of the ocean heat content discussion, just to remind you, is the fact that the heat content that is rising in the oceans by far overwhelms fluctuations in the atmospheric temps and decadal fluctuations in the air temp trend are not a very meaningful indicator of climate change unless you remove the known effects of natural variations first. To remind you again also: the IR and back radiation discussion above, was to clear the misconception that you must have a warming air surface temperature in order to explain a rise in ocean heat content. If you doubt the effects of AGW via CO2 forcing you must explain the observed heat accumulation in the system in another way. If you don’t then you have simply no answer to explain the data. With due respect RC, you can run into the thick of details in the hope to find something to confuse the picture with, but in the end the data speak for themselves. So despite all the complexities of the real world AO interface…. ocean heat content has been rising relentlessly. Once again, if you think that NOAA has made errors in integrating ocean heat content, then I guess you will need to argue your case with them. Eh? What solar variation, what eruptions? Dead right. Four IPCC reports have been about the DANGEROUS effects of ATMOSPHERIC WARMING. Who knows what the effects might be of some warming at the bottom of the ocean? That certainly hasn’t been studied by the IPCC. Painting seems fro concede that the 20-year-old concern about atmospheric warming is now history. That is a huge concession. It seems we can now be relaxed about Himalaya melt rates, heat waves, malaria spread, extreme weather, etc. They were all consequent upon outmoded atmospheric warming and are now over! Just like that! The next big thing is warm water 20,000 leagues under the sea. What does that do? Nothing bad as far as Rob Painting knows. It’s just a scientific curiosity. So why continue with the next COP meeting in Warsaw and all its planned successors? Why carry on with the production of AR5? All these efforts are now passé (so yesterday) – as we move on to the new ocean-based questions Rob has identified. Rob seems to suggest that ocean warming has similar effects to atmospheric warming. Are there any scientific writings to support this counter-intuitive assumption? a) The “trapped heat” is less than previously thought (see Hansen on this – he agrees) because the CS is lower than previously thought. So low, I would submit, that it is pretty much too small to overcome natural variations. We know this is true because the atmosphere is not warming, and the upper 700m of OHC is declining (see ARGO data). The “energy budget response” of the planet is purely theoretical (Hansen has pointed this out repeatedly). We don’t have a measured energy budget response at all – it’s purely modelled results, unless you’re willing to advance the CERES figure of 6.4 W/m2. Good luck with that – nobody believes it. b) There is no need to explain where non-existent heat is coming from. The warmists have been tying themselves in knots over this one, simply because they cannot bring themselves to admit the obvious – they cried “Wolf!” repeatedly and prematurely, and now have egg on their faces. While the video has significant educational content, the conclusions do not reflect a scientific consensus, so we will be withdrawing it and will work on an updated version. they cried “Wolf!” repeatedly and prematurely, and now have egg on their faces. You mixed your metaphors, you bad physicist. (1) The temperature at the base of the troposphere on Uranus would be nowhere near as hot as 320K because virtually no direct Solar radiation gets down there, and there is no surface at that altitude. The planet’s radiating temperature is under 60K because it receives less than 3W/m^2. (2) The temperature of the Venus surface would be nowhere near as hot as 730K (even at the poles) because it receives only about 10% as much direct Solar radiation at its surface as does Earth at its surface. (3) Jupiter would be nowhere near as hot, even in its core, which receives extra kinetic energy which was converted by gravity from gravitational potentential energy due to the continual collapsing of this gaseous planet. This is why Jupiter emits more radiation than it receives. (4) The core of our Moon would be nowhere near as hot as it is thought to be, probably over 1000K. (5) Earth’s surface would indeed be perhaps 20 to 40 degrees colder, and the core, mantle and crust nowhere near as hot, maybe no molten material at all. Think about it! If you’re not sure why, it’s explained in Sections 4 to 9 and Section 15 here. True, but it is possible that the Boy who cried “Wolf!” had egg on his face at the same time. Great Scott! You could be right! We need more evidence. For instance, perhaps the crying wolf happened in a freezing landscape, such as the great mother Russia? The egg would have been frozen and could not have stuck to a face. I shall stop talking in this thread, as it takes days to scroll back to the last Reply link. Whew. Back to work, Treadgold! >”With due respect RC, you can run into the thick of details in the hope to find something to confuse the picture with, but in the end the data speak for themselves. No “hope” required Thomas, the facts of the detail are clear (certainly no confusion) for those who will see but not for those who will not see (that would include you Thomas). BTW, your boorish repetition of the 0-2000m graph is getting tiresome – why don’t you analyze it instead, in view of it’s uselessness in that aggregate form to tell you anything of any consequence? [RC, I missed this. Boorish? Boorish? Epithets like this do the group no favours and spoil your own work. You’re doing great research but I will snip remarks like this from now on. You’re at liberty not to respond. Nobody’s forcing you. >”So despite all the complexities of the real world AO interface…. ocean heat content has been rising relentlessly. In the blinkered, superficial eyes of a warmist, of course it has – and will continue to do so, relentlessly, inexorably, towards a cataclysmic finale in which “the oceans will begin to boil” and millions will die horribly from the searing heat rising up, after lying dormant for years, from the depths of the ocean to persecute body and soul of all those foolish people who ignored your dire warnings. Their basin data seems OK – what’s the problem? Yes. Input is solar energy – period! The “slight decline” is exactly that SLIGHT. Input was still at near-1986 Grand Max levels right up to just recently (2009) when SC 24 spluttered compared to SC 23. The “deficit” is entirely consistent with the cooling upper Pacific and Atlantic OHC, the cooling ocean SST (yes that’s cooling too), and the cooling in GMAST (and yes that’s cooling now also) in the 21st century i.e. the faster responses in the 1 – 100 year response range below. And the system lag below is entirely consistent with the bicentennial input peak at 1986ish. Given the solar-ocean-atmosphere response is lagged the 6, 10 – 100 years of Trenberth, or the 14 +/- 6 yrs of Abdussamatov, or the 1, 12 years of Scafetta, and the most recent and marginally more reliable solar data (even the modern era of solar is fraught with problems), all the metrics are consistent with the solar driver. I emailed Jo Nova on that because it is an astounding and out-of-character statement from Sherwood (and Jo, I, Bob Tisdale, Bob D, and a host of other sceptics of various stripe being intensely interested in OHC developments so this is a “biggy”) and I think she may be seeking more information on just what “other research” he is referring to. We would very much like to know because it’s not headline news in AR5 SOD. Cracked me up – nearly choked on a chocolate peanut slab I was munching. A rise that has peaked. F&R is now rubbish. Dr Tung shredded it and the newer observations have found out their bogus methodology. Their 2010 trajectory is wrong, 2013 ENSO-neutral anomalies are back down to just above baselines (UAH April 2013 +0.1 vs +0.58 2010). Small wonder SkS has taken down their video. Has risen Thomas – past tense not present tense “is rising”. The rise is over – get used to it. We don’t actually live in the ocean Thomas, and I suggest that a meaningful “climate change” comparison is the low solar conditions of the Maunder Minimum (growing season shortened, crop failures, extreme hardship etc) with the relatively pleasant conditions and enhanced crop yields we are experiencing now (unless you live in tornado alley of course). You cannot “remove” that long-term natural variation can you? But all the solar specialists (even the CO2-centric guys) are saying solar conditions are changing to produce at least Dalton Minimum conditions by 2035 and possibly Maunder. The silly proposition from the IPCC is that CO2 forcing will almost completely offset that cooling. Given the complete ineffectiveness of CO2 forcing this century, I think we can readily discount that proposition. Josh Willis’ “floats too cold” 2010 “adjustments” in stark relief – incendiary. Many thanks to Bob Tisdale for bringing UKMO EN3 vs NODC to the attention of the DAGW-sceptical world. @ MIke Josey: You had concerns about the accuracy of ocean temperature measurements, citing a post at WUWT. Here is a good book on the matter. Its available for download as PDF at the link provided. For those who don’t want to read that much, thermometers used can be calibrated to +-0.001C or 1/1000th of a degree. Then there is averaging over a large number of measurements. In the end you get the error bars presented in the NOAA data. As you can see, the signal (the trend in the temp graph) is much larger than the error bars. As measurements have become more frequent and better over time, the error bars in more recent years are smaller than in the past. All in all the ocean heat content integration gives a robust result. Also, to comment on RC’s lament about researchers not doing a ‘basin’ analysis. I am sure the scientists in question have very carefully studied all available data. Also the various basin specific data sets on the NOAA site that I cited a few times above do ad up to the total global heat content that is reported. BTW for the record, when checking the NOAA data tables again I realized that the global OHC increase over the last 10 years in their record is more like 7.5×10^22 Joules than the 4×10^22 Joules I eyeballed from the graph alone. Pays to actually work the data…. So the OHC increase in the last decade (this site claims is a time during which GW had stopped) was more like 22,000 Nuclear power plants @1GW a piece 24×7 for 10 years…. That energy flux, if CO2 climate forcing had indeed somehow stopped, would need some serious alternative explanation one would think. Richard C, you say that their basin data are OK. Good we agree. I have done the work to actually add the basin data up and guess what, the total they report is correct. Adding the basin data up comes to the total NOAA reports. I know you do not want to acknowledge the result of the accounting of the basin data into a total ocean heat content as the outcome is counter your expectations and I know its tiring to point out how the graph presents. But alas the data of NOAA say that the ocean gained 7.5×10^22 Joules over the last 10 years in the NOAA summary record (not only 4×10^22 J as I had eyeballed – should consult my optician… 😉 from the graph before). Stephen Sherwood says also: “‘By assuming that this behaviour will continue, they calculate that the climate will warm about 20 per cent more slowly than previously expected, although over the long term it may be just as bad, since eventually the ocean will stop taking up heat,” Professor Sherwood said.” as quoted in here. Hmm, so we see a slowdown in the heating rate in the last decade (for which several reasonable causes other than a slow down in CO2 forcing are known) and project that forward? 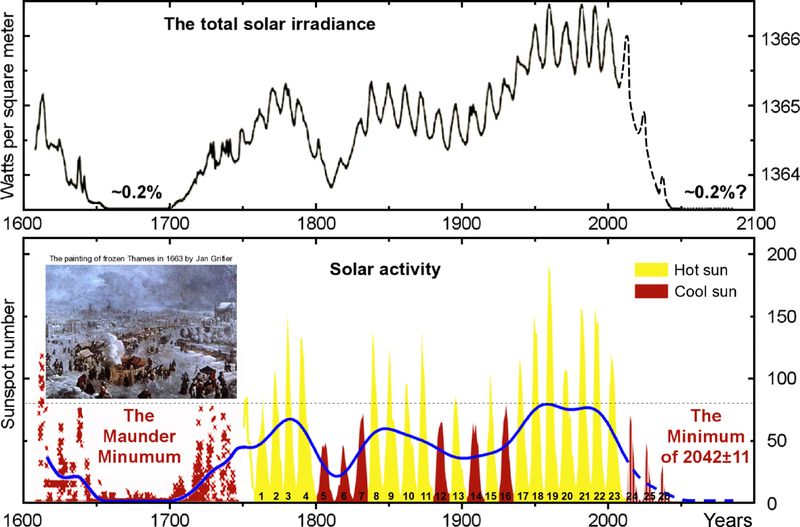 Is that plausible when we know from the record of the last century that we had several periods of about a decade or more during that time where the atmospheric trend suggested (wrongly) that GW had somehow stopped…. Me thinks that there is a lot of wishful thinking here. And in the end, if we hit the wall 20% later in history…. oh the difference it will make, especially if we would – if you guys here had any influence on how policy was made – do nothing in the meanwhile and waste our time instead…. Thomas, you haven’t exactly seized the scientific high ground here despite your “reminder” and bogus assertion that we have some kind of “misconception”. I think if you look you will find you’re sitting on a pile of guano. To examine the diurnal variation of surface conditions in relation to atmospheric deep convection, we divided the surface measurements from the IMET buoy into the convectively suppressed and active periods of the ISO [intra-seasonal oscillation], the same way we did for the IR cloud-top temperature over the IFA in Fig. 7. Figure 15 shows the diurnal cycle of SST, Tair, skin sea surface temperature (Tskin), water vapour specific humidity (q) and equivalent potential temperature (0e) measured at the IMET buoy for the convectively suppressed and active periods of the IS0 (as indicated in Fig. 6). The SST is a bulk sea surface temperature measured at 0.45 m below the sea surface (Weller and Anderson 1996). T,, is calculated using a warm layer and cool skin correction of Fairall et al. (1996). The vertical error bars indicate the mean standard deviation for each surface variable, computed from the diurnal variation (subtracting daily mean from each hourly data). Tair has a diurnal minimum at 0600 LST and increases rapidly after sunrise and reaches the diurnal maximum slightly before Tskin. Cool convective downdraughts from the daytime convection produce a cooling signature in Tair in the afternoon of the suppressed days (Figs. 7(a) and 15(a)), whereas they decrease Tair significantly before dawn during the active periods, when the large convective systems reached maximum strength at night (Figs. 7(b) and 15(b)). The convectively generated cold pools associated with organized convective systems can reduce Tair by as much as 4-5 degC (Parsons et al. 1994; Young et al. 1995; LeMone et al. 1995), similar to values found in GATE* (Houze 1977; Johnson and Nicholls 1983). The diurnal variation in q is very weak, if any (Figs. 15(b) and (d)), as found by Young et al. (1992). The diurnal cycle in Oe, is practically similar to that of Tair. The above observations raise several questions. First, to what degree is the diurnal cycle in Tair related to that in SST and Tskin? A strong diurnal cycle in SST and Tskin can enhance the diurnal cycle in Tair through sensible-heat flux. Zhang (1995) observed that the diurnal cycle in surface sensible-heat flux is quite weak and the diurnal cycle in Tair remains significant while that of SST is small during high-wind and clear-sky situations. Therefore, the diurnal cycle in Tair seems not completely dependent on that in Tskin. The direct solar absorption by the moist surface air apparently plays a role in the diurnal cycle of Tair. It turns out Thomas, in view of the above, that you haven’t a clue what you are talking about. “The diurnal cycle in SST and Tskin is driven by diurnal solar heating but modulated by other factors” therefore Tair (source of “backradiation”/DLR) does NOT drive SST and Tskin. On the contrary, Tskin drives Tair in combination with “direct solar absorption by the moist surface air apparently plays a role in the diurnal cycle of Tair”. You’ve got your drivers back-to-front, horse-before-cart, tail-wagging-dog. Now re DLR. You have not as yet, provided an iota of evidence from the scientific literature that DLR is increasing commensurate with CO2 forcing. On the other hand, I’ve cited 4 papers that find NO CORRELATION in either sign or magnitude “rough cites: Gero and Turner, Francis and Hunter, Wild et al, and some Chinese names I can’t recall [Wu et al I think]”. We’ve been over these papers before here at CCG and could dig them up again but the onus of proof is on you Thomas – not me. So until you provide said evidence Thomas, you’ve got absolute nothing for AGW – zero, zip, nada, squat. Then GIVE US THE CITATIONS IF YOU’RE SO “SURE”. Balmaseda et al haven’t, but Bob Tisdale has. And I have. And probably Bob D too. In fact anyone with an internet connection can very easily – you can too if you adjust your [snip] mind-set only a little. You’ve got as far as the global aggregate, now take the next easy step. Go on Thomas, we know you can do it. They do. And the Indian Ocean provides the skew. Neither you nor the IPCC has presented any evidence (I’m talking scientific literature – not hand-waving) that CO2 forcing has any effect whatsoever on OHC. No detailed mechanism, no observations, no quantification, nothing. Tskin drives Tair in combination with “direct solar absorption by the moist surface air apparently plays a role in the diurnal cycle of Tair” (‘Diurnal variation and life-cycle of deep convective systems over the tropical Pacific warm pool’ CHEN and HOUZE Jr (1997). So you promptly forget the basin data you accessed and now you’re mesmerized by the aggregate as if Indian Ocean skew is typical of the other 2 basins – you are no scientist or data analyst Thomas. >”I know you do not want to acknowledge the result of the accounting of the basin data into a total ocean heat content as the outcome is counter your expectations and I know its tiring to point out how the graph presents. We do “acknowledge” the aggregate but it is meaningless for analysis purposes. And it’s even more tiring for us to point out what basin analysis presents I assure you. And “alas”, the major contribution to the gain was from ONE basin – the Indian Ocean. On the other hand a loss was returned from the upper Pacific and Atlantic since 2003 – i.e. AGW was not a driver of OHC since 2003 at least. Sherwood is pointing out that Otto et al’s assumption re OHC is not necessarily valid (“should be taken with a grain of salt”). Are you saying that the CO2 forcing uptick began over 100 years ago? I don’t think it did Thomas. On the other hand, solar forcing did. Now the same is about to happen because their treatment of solar is laughable. Right now the wishful thinking – as evidenced by models vs observations above – is on the part of CO2-centric climate science. And don’t kid yourself that we don’t influence policy – NZ is out of Kyoto, Copenhagen collapsed after Climategate, and the Christchurch earthquake subsumes climate change policy anyway i.e. climate change is a relative non-issue, do-nothing is just sensible and economically the best option. Not 97% of scientists Andy, 97% of peer-reviewed scientific journal publications. Yes I understand that Simon, but regardless the figures are rubbish as has been reported widely. Clarification: Only 24 papers concluded an outright rejection of AGW. The remainder of the 3% concluded that greenhouse gases were not the dominant contributor to global warming. And where in this “survey” was there any discussion of climate sensitivity? How many links would you like me to post to show what utter weapons grade BS this paper is? Heh! Scratching for spin Simon? Cook calls this “an overwhelming consensus”. The paper’s rubbish anyway as evidenced by the responses to it of Id, Scafetta and Shaviv. Interesting graph that suggests that the proportion confirming AGW versus rejection is probably higher than 97%. Throw out your favourite sceptics and you might get it down to 96%. And ignoring the obvious bogosity? Cook survey included 10 of my 122 eligible papers. 5/10 were rated incorrectly. 4/5 were rated as endorse rather than neutral. >”Note to RC – why? Because this is the one of the biggest GW/CC issues and SkS is in the forefront (their POV gets promulgated all over – they have a network that includes The Guardian) of promoting a propagandist message based on their POV but when their own comment thread goes awry they rearrange it, censor it. and otherwise edit it. If you record the initial thread structure it is still available from the blog database no matter how much they modify it. If you can’t get to grips with what was basically a brief synopsis then I fear for your understanding of it RT. I posted the links to my full 3 part expanded series documenting the issues that you asked me to supply for a guest post instead of “prolix” comments but you haven’t posted it and the series links to it got snipped along with the SkS comments. So what am I to do? Here is a polite suggestion. If you have material that you want posted somewhere, and RT is resistant, maybe you could set up your own WordPress blog? It doesn’t take a minute. Then you could post to your heart’s content and link back to it from here. I mean this in the kindest possible way; you have a lot of very useful input here, and I don’t want to see you go off in a huff. A personal blog could be a supplementary reading thing for those who are interested. Regardless of the rest of D Cotton’s theory, your post has mystified me. Perhaps I’m not understanding what you’re saying. The hottest part of the air column on Earth is at the bottom (at least until the tropopause), and hot air balloons do fly. Yes I have thought about that Andy and I did have a blog going myself on another topic that incorporated some of the CC issues but thanks for the suggestion. The thing is, RT actually requested me by email to supply a guest post on the specifically topical issue of anthro ocean heating (or not) to avoid “prolix” comments on it and I’ve provided a 3 part series but nothing has come of that yet so as I said “what do I do?”, I comply but get rebuffed. Either that or RT is of a mind to post the series eventually but that the delay was unfortunate because events overtook him. I’m just reluctant to dilute the debate with another blog when the opportunity is here at CCG where there is already a huge resource and a pretty good following that attracts the kind of debate that needs the issues defined – if RT would let that happen without too much snipping (I realize the need to snip at times – don’t get me wrong). I don’t give equal attention to NZCC for example for this reason. The other thing is, I’m prolific when there’s rain delays in the kiwifruit harvest as there has been recently and I’ve got the time. But when it’s fine I put in 50–60-hour weeks (nightshift) and can’t run a blog even though the thought is appealing, neither do I have much time for reasoned discussion as with Thomas lately. Also later in the year through to September I’m committed to solid work because the fruit comes out of storage i.e. no rain delays. You wont hear from me much then, if at all. The reason I copy so much is that I don’t make the assumption that people will ALWAYS follow a link as to the GHE article. I very much doubt they do. And interpreting, paraphrasing, summarising other comments or articles e.g. the SkS comment thread as RT asked to do or Hockey Schtick commentaries, is fraught with problems as Ken’s post on me re HS attests. Also the warmists prefer that anything inconvenient to them stays hidden so having it in their faces forces them to address it (and not just warmists I note). To date, after posting the links several times, I’ve no idea at all whether anyone has actually read, let alone fully understood ‘Anthropogenic Ocean Heating?’ parts 1,2, and 3. I sent it to Jo Nova but that was at a time when her old computer crashed so the initiative was lost, I don’t think she got around to reading it either what with her having to set up from scratch with a new computer. So much for the “travesty”. H/t Tom Nelson via WUWT. I comply but get rebuffed. Either that or RT is of a mind to post the series eventually but that the delay was unfortunate because events overtook him. Yes, good guess, RC. I’ve been intending to post them since Tuesday. You have not been rebuffed. Not everything revolves around you. I’m well aware it doesn’t and haven’t intimated that it does so why do you imply/misconstrue that I think that RT? There’s a multitude of subtitles at work in the wider scope of this discussion. Do you understand them all enough to write your own post(s) on it all RT? You certainly are a prickly customer, RC, but you said yourself: you “get rebuffed.” But that was egocentric just because the delay has nothing to do with you. Let it go now. Do you understand them all enough to write your own post(s) on it all RT? Now, I guess the hyphen before Trenberth implies “as in the paper/s of …” and I guess the three names refer to three unnamed papers or even several papers from each author. But it’s not clear and needs time to follow up. If you understand it enough to write a post on it, please do so. I’m sure it would help. But I shouldn’t be taking time on this when there are other posts waiting, like your series. i.e. Nothing “egocentric” because I understood your constraints (work to do, other posts, OHC not top of your priorities, or even a priority, etc, etc). So I suggest that it is you that should let go the notion that I think everything “revolves around me” and that my attitude is “egocentric” – I don’t and it isn’t. It is hard enough as it is debating this OHC issue at Hot Topic (as I have at length already with Rob Painting – we’re not that far apart on it BTW despite stalemate) or Skeptical Science (brush with Dana Nuccitelli – much of that thread “modified”) or Jo Nova (arduous battle with troll Nice One) or here at Climate Conversation Group (latest skirmish with Thomas) without having to combat personal attacks here too. You on the other hand haven’t yet started to engage in this debate at the level of detail that has being going on head-to-head elsewhere for years now. I’ve already done hard yards, I know and have read the relevant papers, the issues, the data, the missing evidence. And I’m pretty much a lone sceptic voice in those particular engagements at a detailed level. It takes a bit of fortitude when you’re holding up a side on your own, taking all the put-downs/innuendo/misconstrual/slime/slur in my stride and I’d be stuffed for argument at times if it wasn’t for others in a similar position who have gone before and broken ground e.g. Bob Tisdale and Alec Rawls. Those guys deserve a lot of credit for laying out the issues, that credit has to be earned.